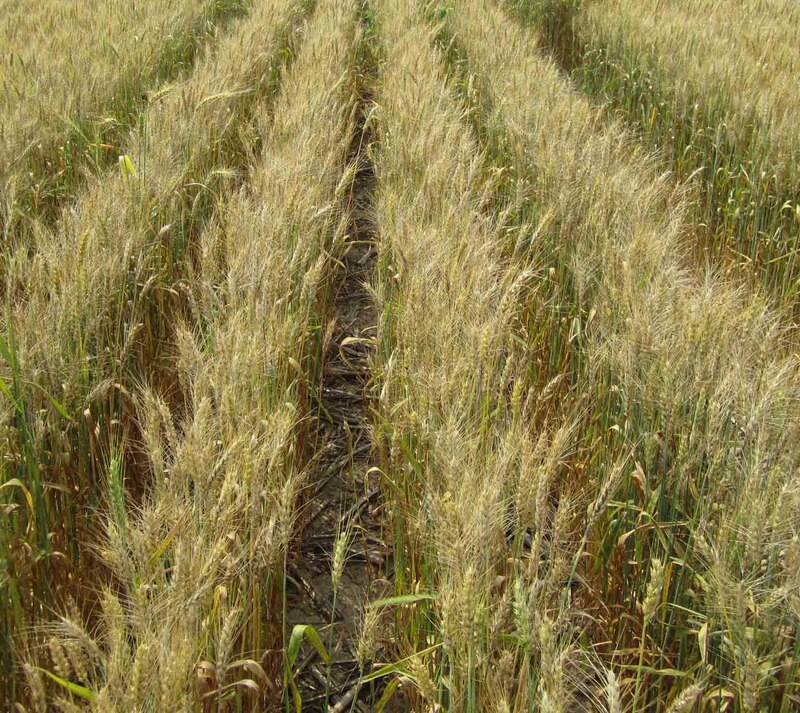 Each year producers decide whether to store or sell their Soft Red Wheat (SRW) crop. Producers typically choose the latter and sell their crop off of the combine. This year the Chicago wheat (SRW) futures contract is offering a large storage incentive. The relationship between July 2011 Chicago wheat futures and March 2012 Chicago wheat futures is a plus $1.04/bu (March = $8.63, July = $7.59). Putting grain in storage AND selling a March 2012 futures contract will gain you an additional $1.04/bu. However, there are other costs and risk associated with doing this. Storage decisions should be made based upon the carry offered in the futures market, storage constraints (coming from other crops), harvest constraints, storage costs, opportunity costs of money, and other costs. ﻿ ﻿ Earlier, we posted about sidewall compaction with the understanding that farmers had to plant when they could plant and in some cases, this meant planting into fields that were a little too wet. Yesterday I visited a field where the farmer was concerned because the corn was "yellow and dying". The county agent and I visited the field at the perfect time because a rain from the night before had kept the soils wet and improved the appearance of the corn. Corn in a compacted seed furrow. The slit of the furrow is still open. The oldest leaf has brown along the margin and yellow moving toward the midrib of the leaf, which is typical K deficiency symptoms. 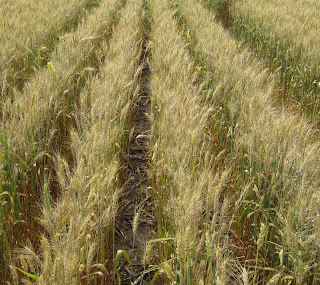 The 2011 Kentucky Extension Wheat Yield Contest forms are available in both pdf and doc formats. The rules and procedures are the same as in 2010. The rush to get corn and soybeans planted, wheat harvested and double-crop soybeans planted might make this a challenging year to get entries in the contest. Thanks in advance to those who chose to compete this season. In a recent blog post, Dr. Murdock talked about temporary sulfur deficiency in corn. Below are some images of what we believe to be sulfur deficiency and a couple images of zinc deficiency for comparison. The two can be a bit confusing in some instances.We do not expect the sulfur deficiency symptoms in these images to lead to yield losses. Once we get rain, the symptoms should dissappear. Early season rains and major flooding of bottom ground has significantly impacted planting decisions by some corn and soybean producers. As a result there are likely to be cropland in Kentucky that will not be planted this season. However, a successful weed control program may still be a needed to keep weed pressure down and reduce the introduction of more weed seed into the soil seed bank which can impact future crops. Sulfur (S) is available to the plants in the sulfate form and it can be leached deeper into the soil with high rainfall on soils that have high amounts of sand. With the large amount of rainfall we have had this year the sulfate sulfur may have been leached from the top few inches of sandy soils. As the plant begins its early growth with shallow rooting systems ,a temporary S deficiency could be experienced in these types of soils. This deficiency should correct itself quickly as the roots reach deeper into the profile where the concentrations of S will be higher due to an increase in the clay content. The organic matter in the soil will also begin decomposition rapidly as the temperatures warms, releasing S for plant uptake. An early temporary S deficiency has never been found to be yield limiting. Plants which experience a sulfur deficiency will have a pale light green to yellow colors in the upper most leaves; the lower leaves will look normal and darker green. If these symptoms appear, they should return to normal color as the roots expand deeper into the soil.